It has been five years since Mary Bowman first took the mic and disclosed her biggest secret to a live audience—she was born with HIV 26 years ago, in a Maryland suburb outside of Washington, DC, to a drug-addicted mother who died when Bowman was just 3 years old. “The sickness she denied lies in my blood with a lesser value,” is the big reveal in her poem “Dandelions,” the first work she performed that declared her fears about dealing with her HIV status growing up. Since Bowman’s award-winning poetry collection, LOTUS, was published in 2011, the poet and songwriter has been at the forefront of a growing movement that uses storytelling and art to educate others about HIV/AIDS and to destroy the related stigma that can be as deadly as the virus itself. Between recording her first R&B album, hosting monthly poetry open mics across the DC area and teaching her creative craft to local kids, Bowman has performed her poetry at HIV events and at colleges across the East Coast. 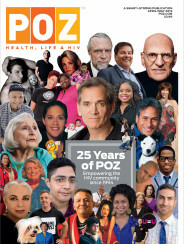 In this edited POZ interview, the artist reflects on her accomplishments and shares her plans for the future. What was the initial reaction to LOTUS? I did the book because at that time in my life I was dealing with depression, dealing with anxiety. I’d been in and out of the hospital for mental illness and I just wanted to have something that I could commit to and follow through with. To go through the whole process of writing the poetry, getting the pages together—it was an amazing accomplishment. I didn’t put the book out to receive accolades or book sales. There’s a company out of Philadelphia called 2 Pens & Lint; a friend of mine runs it, so I went through them to publish it. But when I finished it, it just became this big thing—people telling me all the time, “When I fell down, I read your book,” coming to me and saying, “I started crying when I read that poem.” That kind of response was really big. Bigger than I thought it would be, because I didn’t think it would be anything. When I won that award, I didn’t even know I could be nominated. That was one of the best moments of my career. That people even consider me in the same sentence as Maya Angelou—she’s one of my biggest inspirations, somebody that I read up on a lot. Big shoes to fill. I hope one day I’ll be able to live up to the standard that people hold me to. Love B.O.A.T.S., your new album available on iTunes and Amazon, is a lot different from LOTUS. Are you moving away from poetry? When I started performing, it was strictly poetry. But then someone found out that I could sing and was like, “Why don’t you write songs?” I wouldn’t say I’m moving from one thing to another—I think I’m just trying to fuse them together more. I recorded all the tracks with my producer Kwame, a.k.a. Oeaux, in his home studio, along with Jacob Avis. I met them through connections, through poetry, and we had this awesome, amazing chemistry working with each other. As for the album, there’s a little bit of soul in there, jazz, there’s a touch of classical, there’s a touch of R&B. Musically, I really don’t know which one to pick, especially because there’s spoken word on there as well. The name is also a play on a local drug here in DC with the name “Love Boat.” I’ve never tried this drug, but when I looked up the side effects, it’s like, you start seeing things, you hear things. It’s very cosmic, very euphoric, and you think that things are going to be one way and then the come down of the drug is really harsh. The fall of that relationship was a lot like being on a Love Boat trip. Did your status factor into that relationship? No. I have been blessed to deal with women who really don’t care about others’ opinions. The people that they love are the people that they love, regardless of what people say or think. So, in that way, it was a regular relationship. We talked more about TV than about HIV. 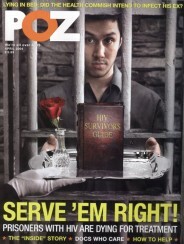 Are you continuing your HIV activism? Definitely. I usually have the most performances when there are AIDS awareness days. I recently performed at a fashion show at James Madison University, and I did a stigma conference at Howard University. I also do open mics in DC and just became a host at [poetry venue] Busboys and Poets in Virginia. I’m still working at the Women’s Collective. We take women in from the community who want to become advocates. We coordinate training sessions, group activities, take them out to [Ryan White Planning Council] meetings, just really get them used to being an advocate and what that means and how they can help their community in their own ways. I’m also still working on P.O.E.T., or Purpose Over Entertainment. I’m trying to turn it into something like an entertainment business where, if you need an [HIV-positive] advocate to come speak at your event, through poetry, singing, art or whatever, then we’ll have somebody who can do that. What are your plans as an HIV-positive artist? Over the next five years, I would like more professional gigs in other countries. I want to see myself having at least two more CDs and to finish my book I’m currently writing. I don’t want to say the title of my book, because I don’t want to do the whole “spoiler alert” thing, but it’s a book about the parts of me I don’t share on stage, about my HIV status. It’s going to be a mix of poetry, journal entries and short stories of actual things that have happened in my life. I am also working on another concept album that is going to be more HIV-focused. I hope to have the album out by December 1, so we can do a World AIDS Day premiere. I’m also going to be this year’s ambassador for the U.S. Department of Health Office of Women’s Health for their Women and Girls HIV/AIDS Awareness Day, mostly doing social media, tweeting out about the event. What drives you to continue with your performance career? I want to show people living with HIV that they don’t have to hide their status, even if they pursue their dreams. I want to de-stigmatize the entertainment world, to show little girls that grew up like me—who didn’t see anybody who had HIV doing what I wanted to do—that they can achieve whatever they want to do. But I’d rather die telling people what HIV looks like then to live with knowing I haven’t said a word.